When Peachy Canyon Winery gave me a hat tip on Twitter for my handle, which is the same as my blog name, I knew we’d get along. Then when they told me they they made luscious reds, I really knew we’d get along. I picked up a bottle of their 2008 “Incredible Red” Zinfandel recently and it was the last in stock! It had a different label than the more recent vintages, so I assume the winery went through some sort of rebranding. Sometimes it pays off to pick one of the things that’s not like the others. I poured my boyfriend and I each a glass as we were cooking dinner last week. I almost always start sipping while stirring and chopping, well before dinner is actually served. A deep ruby, the wine envelops your tongue with its peppery, but fruity flavor. This is an easy drinking wine and great to have around for a mid-week sip. It got along swimmingly with the chimichurri chicken and paprika brussel sprouts we had for dinner. 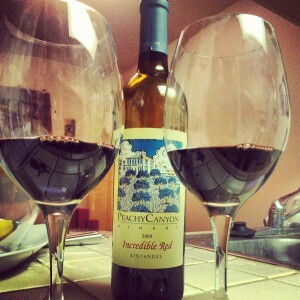 According to foodandwinepairing.org, it’s not ideal to mix chicken with Zinfandel, but it tasted fine to me! Sometimes I pay attention to food pairings, but usually by the rule of thumb: whites with fish, reds with meat. I usually drink what I want to drink and eat what I want to eat. If someone wants to make me a delicious six course meal paired with matching wines and blow me away with the pairings, maybe I’ll change my tune. So who’s ready to cook me dinner? Have you tried Peachy Canyon 2011 Zinfandel “Westside”, Paso Robles? Stellar wine so good straight out of the bottle but decant, if you can force yourself to wait, for an hour and then go get more before it’s gone! I have not, but I will keep an eye out for it now!